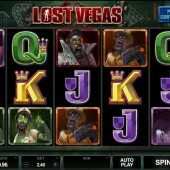 Lost Vegas is a 243way 5-reel 3-row slot from casino software company Microgaming. It has a dark theme with zombie versions of old dead stars who performed in Vegas, including Elvis Presley standing in a torn and tattered white glitter suit and crazed eyes. The soundtrack is quite spooky and the graphics decent as is usual with Microgaming slots. As well as zombies you have the usual A-K-Q symbols and Wilds on Lost Veags slot. Wilds are on all reels with no multiplier and aren't stacked but you can get 2 in view on a reel. The top-paying symbol is 5-of-a-kind Wilds (5OAK) paying a measly 10x stake, but this is a 243 way game so this gives a clue of the multiple ways available in the bonuses. The lowest only pay 1.33x stake for 5OAK. There are a couple of random in-play features on Lost Vegas. Firstly the screen may craze and a withered fist will unravel to present you with a cash prize. Then we have a scene whereby the game darkens and all face symbols pay a multiple x stake. Should a scatter be present, that triggers the free spins. This is the same as the T-800 vision feature on Microgaming's Terminator 2 slot. 3 scatters or 1 scatter in the random feature described above trigger the free games. You get up to 50 and you will either be 'survivor' or 'zombie'. 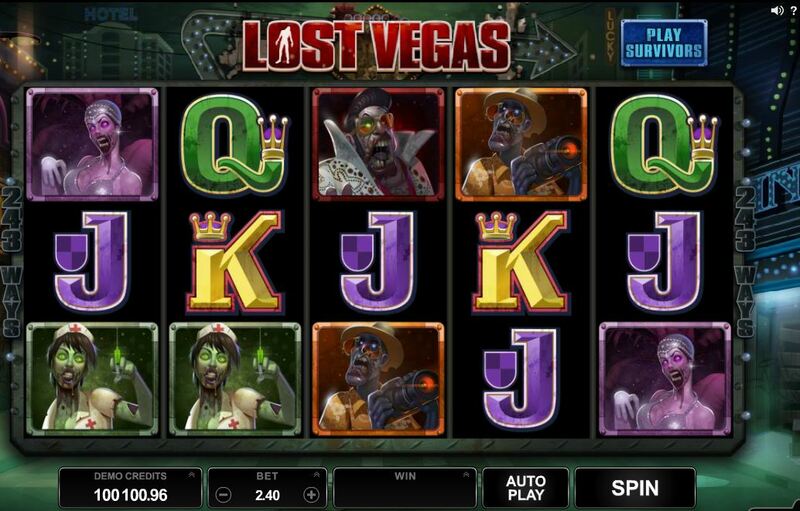 If zombie you get free spins until all 5 reels become 'infected'. This means that because the zombies are stacked each time one lands in full view on any reel, the reel is infected with stacked Wilds. Once all 5 reels have become infected the spins end. If you are 'survivor' you get free games which remove A-K-Q-J-10 and 9 from the reels when they land in view. This increases zombie symbols therefore win potential but also increases the chances of removing all the card symbols at which point the spins end. You can decide whether you are a zombie or survivor in the base game screen, where you can choose your character. Your free spins will be appropriate for what you chose.